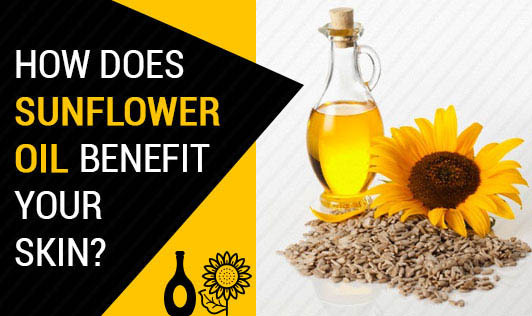 How does sunflower oil benefit your skin? The large amount of vitamin E in the oil traps the moisture inside the skin cells, keeping it hydrated for a long time. One simple way of using the oil, is by adding a few drops of it in any commercial cream you use. Vitamin E found in sunflower oil is also a strong antioxidant, which prevents damage from the free radicals. A study conducted at the University of Maryland Medical Center concluded that Vitamin E present in skincare products was found to protect the collagen and elastin in the skin and reduce fine lines and wrinkles. Using sunflower oil several times a week can help you postpone the effects of ageing. Vitamin E decreases redness and roughness and improve over all skin appearance. The linoleic fatty acid in it helps to decrease skin inflammation caused due to conditions like acne, dermatitis, and sun burns. It also helps to initiate the development of new skin cells and constantly ensures rejuvenated even skin. Vitamin E forms a protective layer on the skin, shields it from environmental damage, and limits moisture loss. According to Wikipedia reports, sunflower oil treatment lowers the risk of skin infections in premature infants in hospitals. Make sure you consult your dermatologist and check for allergic reactions, before using the oil for skin care.